Zebpay exchange announces support for Tron Blockchain, besides adding TRX/XRP. The moving averages signal higher consolidation for TRX/USD. 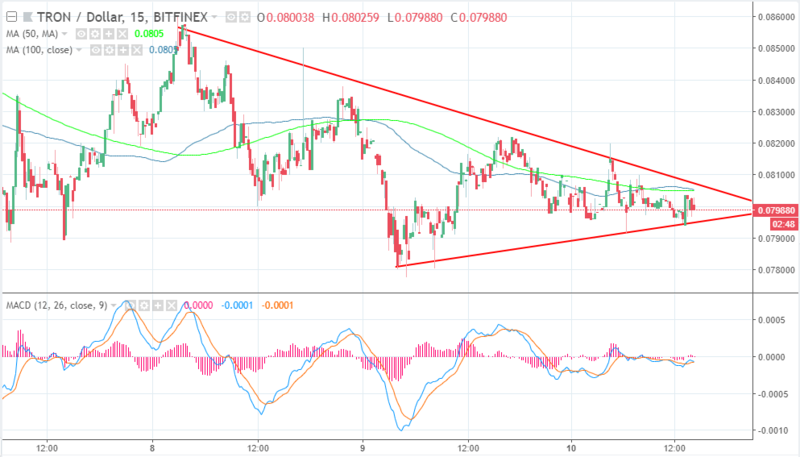 Tron price is trading up and down the pivotal $0.08 level while the upside is limited by the moving averages. TRX/USD tested the major resistance level at $0.082 but lacked enough moment resulting in more downside movements. The price is down 1.63% in the last 24 hours, although indicators point towards higher intraday corrections. The leading cryptocurrency exchange in India, Zebpay has announced that it is adding support for TRX/XRP trading. The announcement was made via a tweeter message to its followers who welcomed the news in open arms. The cryptocurrency exchanges are still operating despite the decision by the central bank to cut off all banking support. Their cases several court filings opposing the decision of India Reserve Bank (IRB) with some people terming hypocritical after it announced plans to launch its own digital asset. Tron CEO, Justin Sun replied to the announcement by Zebpay exchange saying “Thank you.” The exchange has also announced that it will support the soon launching Tron Blockchain. Technically, Tron price is currently trading at $0.79, at the same time, a bullish momentum is growing around level on the charts. The 50 SMA is attempting to cross above the 100 SMA which could signal for short-term buying entries. Besides, the MACD is in the negative territory, however, it is pointing towards the mean (0.0000). An immediate support is formed at $0.08000, but $0.079 will provide stronger support to the downside.